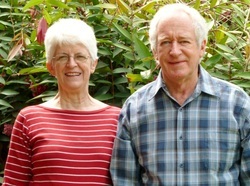 "Reminiscences of Living in Servants’ Quarters"
Morris & Julie Moorhouse have lived at 33 Piddington Street since 1968, when they purchased the old Service Wing of the St John’s Wood House (also known as “The Granite House”) just prior to their marriage. This wing had been in existence some 104 years prior to their purchase having been built in 1864 so there was a lot of history that preceded them. At the time of their purchase, there were tenants living in the house who had been there for approximately 20 years. The rent was $2.00 a week! After some time and negotiations the tenants were eventually able to apply for a Qld. Housing Commission House and moved out many months later. The old house was not in very good condition when they took possession but it had great potential and atmosphere with the design not at all typical of an Ashgrove house. They set about bringing the house into a livable condition suitable to expectations at the time, bearing in mind that demolition of the house would occur if satisfactory living results were not achieved. It was found the 3 main rooms were large, with high ceilings,(plaster walls and ceilings with ornate cornices being added in 1942), wide skirting boards and beech timber floors all requiring cleaning and painting with the plaster wall removed in the dining room due to it collapsing. Prior to the plaster wall upgrade the rooms were un-painted lambs tongue mould boards with no ceiling. The original laundry had a large fire place to house the copper, with a pine surround and mantle shelf being added later during the early upgrade – they made use of this by constructing the chimney recess to function as a fire place. This room was their living room and the other two rooms became the bed room and the dining room. The brick chimney has four flues with the baker’s oven and recesses for two kitchen ranges now on the outside and closed up. 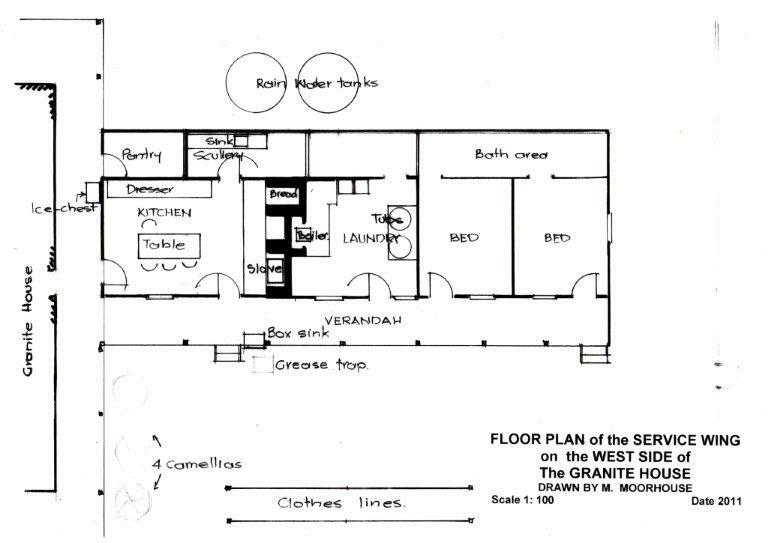 There was an enclosed verandah two meters wide on either side to the house where the upgraded kitchen and bathroom were extended on the southern verandah and a lean-to metal sheeted garage, housing a primitive laundry, was built on the west end. A toilet and upgraded laundry were extended out on the north side when the sewer was connected in 1965. One of the old rooms had a message scrawled on the timber wall relating to the “setting of 24 runner duck eggs”. 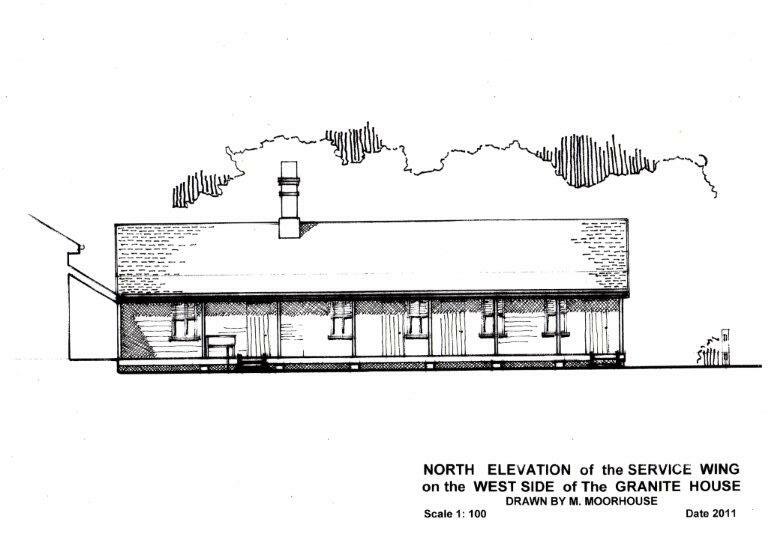 The old (disused) original kitchen was removed in 1949 when the service wing was detached from the Homestead and made into a separate dwelling on its own title dead. Thus over a long period of time it was found the house was constantly being worked upon although simple maintenance did not occur often, if at all. With the passing of about five years they became attached to parts of the very original house, decided some of these could be re-used, demolished poor parts and in 1976, major alterations were carried out to the house which involved the removal of the old garage, kitchen, bathroom, dining room and laundry. A new two storey section was added on the west side which has the main bedroom upstairs, with two bedrooms, kitchen, family room, laundry and bathroom on the lower level all designed to match together and be integrated with the old. Morris recalls that at the time of moving in, Piddington Street itself was not fully paved, with only a wide strip of bitumen in the centre, with the edges being gravel and a concrete kerb and channel. There was only one distant street light which at night time was quite dark. Enoggera Creek around St John’s Wood has always been affected by flooding and the 1974 flood was no exception which had a great effect on the residents and property close to the creek. Enoggera Creek flooded with water half way up Gresham Street and entering the shops at Chandlers Corner. Residents could not get in or out for several days. In the early years, the garbage man collected their bin from inside the yard and carried it to the truck in the street, and mail was delivered daily by the postman on bicycle, with a blow of his whistle. Milk was delivered in glass bottles each morning and the money and empty bottles were left out on the door step. Later, in 1991, milk was delivered 3 days a week and finally ceased in 1999. There was also an ice cream truck and a fish man who drove around the streets ringing their bells and selling their goods. Along the Piddington Street frontage (of both properties) there are four Poinciana Trees planted in the 1940s which are now fully grown and giving a splendid display in November when they flower. In the front yard of their house, there is an mature pecan nut tree probably planted by the previous tenants. It is a prolific bearer of nuts, however, the white cockatoos have discovered the nuts and Morris and Julie say they are lucky if they get a handful. With their investigations of the House they have been able to observe historically how the building has progressed over time through the many changes over the past 149 years. From when it was servicing the Homestead to when it out-lived its usefulness when servants were not required (becoming somewhat derelict) through to a re-generation of use to a single residence in its own right to a major extension (by them). In all, a small section of the original remains which can show how it was back in original times for many a Homestead Service Wing was demolished and no physical record remains. The new house in 2008. As a further development of Morris and Julie’s reminiscences, Morris has investigated the previous or early history of their house at 33 Piddington Street. This may be considered a continuing investigation but there is a time when the obtained facts should be recorded. Thus, this is the purpose of this paper. Seeing Morris has architectural knowledge, and even though there were many personalities who resided and worked at the estate, Morris was just as interested in the actual structure of the building. This work was centred on the Service Wing, rather than the Granite House. It is well recorded that in 1864 Daniel Rowntree Somerset built the Granite House on his St John’s Wood Estate (which he named after his son Henry St John Somerset), with a service wing at the rear or west side. This was abutting the main house, as was usual in those times, to separate the work area from the main section – in case of fire as well as to separate the workers from the owner’s family. Initially, it comprised only a kitchen and a laundry, with stores and pantry, of timber construction with a shingle roof and between the kitchen and laundry, a large four-flued brick chimney. This had on the kitchen side, a baker’s oven and two recesses for cooking ranges and a recess on the laundry side for a copper. It is not known where the servants slept as there were no bedrooms in this section. It should be appreciated that the Estate was “way out in the bush”, with the closest settlement being at Hale Street. Glenlyon House was not yet built but Bardon House was built but not occupied. There were, of course, other settler’s shacks scattered at various places in Ashgrove and The Gap. purchased the property. In 1877, Harding with Architect Richard Gailey, carried out major extensions. The Service Wing was extended to include two bedrooms and other small storerooms, with a verandah along the north side as access to the house. Further west were exercise yards, stables and a coach house. estate in 1934 and built a new kitchen and bathroom in about 1936 by enclosing part of the SW verandah of the Granite House. With the new kitchen, the old antiquated kitchen in the service wing was no longer required and the wing was not used. building use. Kitchen appliances were being developed which were much easier to use, such as the electric stove, and these were incorporated within the house. The lady of the house was able to look after the kitchen affairs herself and servants were not required. show his interpretation of his findings. level. The verandah floor was 150mm wide hardwood shot edge boards. The external wall sheeting was hardwood weatherboards on the north and west sides with vertical lambs tongue mouldings on the south side. The internal walls were 150mm wide lambs tongue mouldings and from what can be interpreted, there was no ceiling. In the bedrooms it is likely there may have been white calico fixed to the underside of the ceiling joists. oxide stain rather than the paint we know today. The roof was sheeted in shingles and from photographs, this lasted a considerable time with corrugated galvanised iron being installed sometime after 1939. Above the dresser in the kitchen were bells which were connected to the pull bell cords in the various rooms in the homestead. The above is a précis of Morris’ findings.